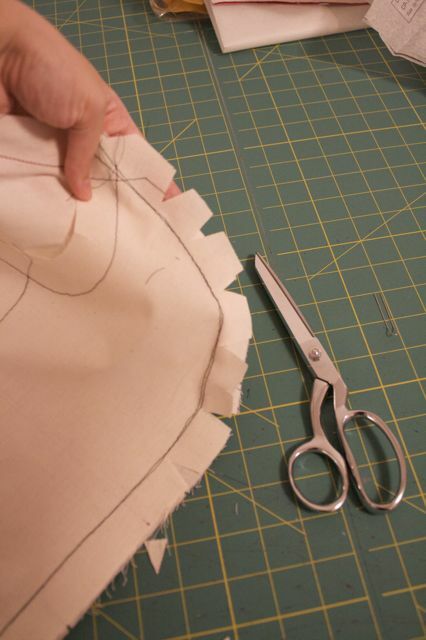 In preparation for our coat sew-along, I thought I'd do a "back-to-basics" type of tutorial that will help with the Lady Grey pattern: how to sew princess seams. 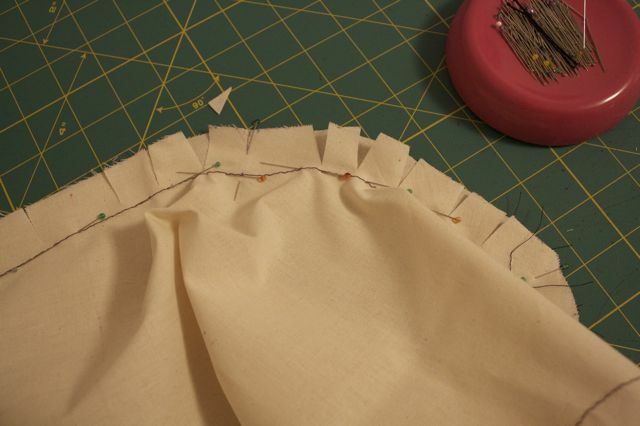 Princess seams are only tricky because one pattern piece is more curved than the other, resulting in potential differences in length and puckering. But with proper clipping, notching, and pressing, they're a snap! 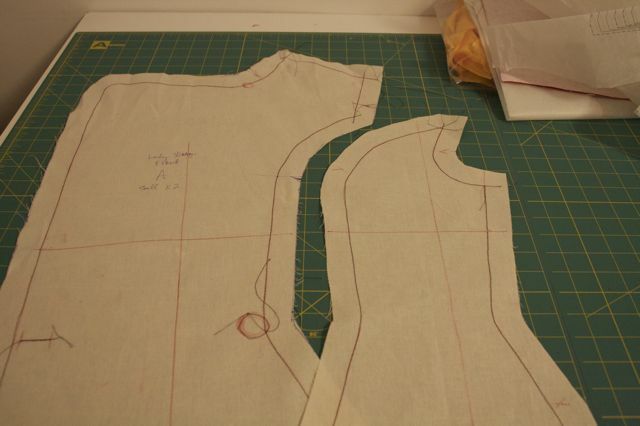 Here's what your front pieces look like; they will be sewn together to form an armhole princess seam. Start by clipping the less curvy piece (the front, on the left here) around the bust at regular intervals, around 1" apart. Be careful not to clip too close to the seamline. Now, spread the clipped side to fit the curvy side piece. Pin along the seamline. Your clips will spread out to allow the pieces to fit together. You might want to also clip around the waist, since this pattern is curvy there too. Now, go to your machine and stitch the seam, being careful to avoid puckers as you go along. 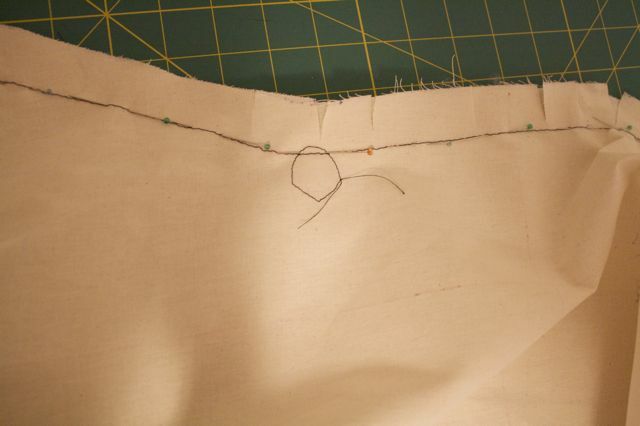 Here's the stitched seam. Next, you want to help the other seam allowance (the unclipped one) lie flat. Flip the two pieces together so that this side is on top. You're going to notch this side, staggering your notches with your clips on the opposite seam allowance. Time to press! Make sure to use a tailor's ham. See how the clips spread out, and the notches overlap each other? Here it is, all pressed! Let me know if you have any questions–or princess seam methods of your own! Update 2: Here are a few more shots of how the pieces meet up at the shoulder, as requested. Hope this helps! Thank you for this tutorial. I haven't started assembling the muslin as I suspected you had some useful posts on it an I wasn't wrong. You doing more assembling posts? I never thought to clip both sides opposite each other! You're so full of wonderful tips! I've not started assembling either. I've never sewn princess seams so thank you for this. 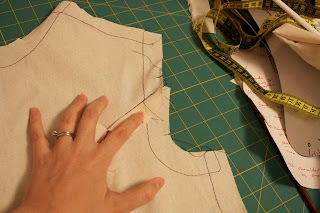 I'm going to have to make a tailor's ham tonight before I start sewing the bits together. I've been meaning to make one for a while so I guess I'd best get on with it! 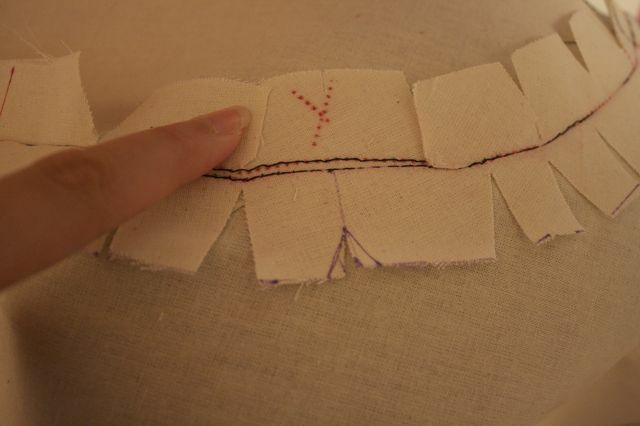 I have another method which might be useful if you're concerned about having to let out your princess seams a bit: put a gathering stitch in the seam allowance of the more curved piece and use this to ease the extra curve into position. Press it all over to one side and don't notch it until you've done a fitting. 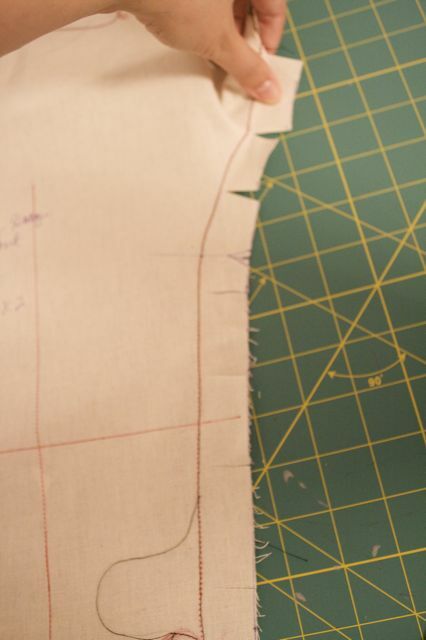 If I'm happy with the fit of the seams/garment I then rip out the basting and then follow your method. I've found it hard to let out princess seams that are already notched. Oh my goodness,thank you! I kind of quit sewing for a few months because of princess seams. You're my hero. Great tip, Josephine! I added it as an update to the post. 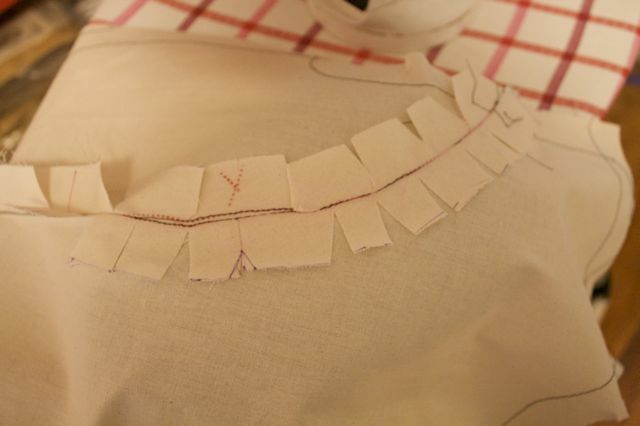 Suzy, I might do a couple more things like inserting the sleeves (thought I don't really have any special tips for the stage of the process) and then how to press up the outer edges of the collar and lapel. I'll try to get these up tomorrow! Thanks for adding that tip, Josephine! I was wondering about that. Oooo! Thanks so much Gertie. I wasn't so worried about the muslin, but DEFINITELY once the actual fabric is being used. I understand this technique for a coat or anything lined. But what about unlined dresses? I wouldn´t know how to serge them in a "clean"-looking way. Thanks! I haven't done very many princess seams before. I finally finished all of the tedious thread tracing and stay stitching on my muslin last night, and thought I'd just stitch up the front to the sides. I didn't want to clip into the muslin, since it will be the pattern for the main coat eventually, so I just pinned the pieces together. 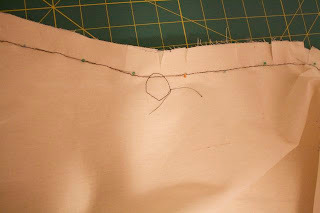 I ended up with a couple extra inches of length in the side piece, and just gave up and went to bed without sewing it. Lo and behold, now I understand! Thanks, Gertie! Thanks for the tutorial! I had a TERRIBLE time getting the upper points of the side pieces to line up with the front/back pieces - so once mine are sewed together, there's a point sticking up into the armscye... if that makes sense. I don't remember having this problem before! Could you possibly post a photo (either an update here or in the Flikr pool) of the upper part and how you matched things up? You line looks perfect!! I couldn't quite get a good view by zooming in on the pictures you have up! If you don't have the time, I get that! You must be feeling a little swamped with a job, a book and 140 people (at least) anxiously awaiting your next posts! This is great! Thankyou so much. Always the best tutorials. I've tried princess seams before, but clipped and notched both sides before sewing. I tried so hard but they were always just a little bunched. I'm looking forward to giving this one a go! I would really love to see your tips on reducing the bust! This is always a drama for me too. I'm with Suzy- I'd love as many tips as possible, they are definately likely to reduce alot of swearing. Great tutorial. One question... what is the best way to finish the cliped edges of your garment so the threads will not unravel when washing? Thanks so much for this how-to. I am learning so much. Thanks for the tutorial. 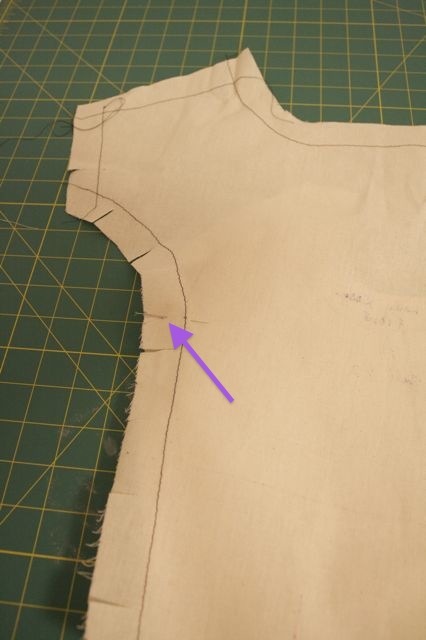 I always wondered what was difference between clipping the seams, and notching them. Your pictures explain it very well. The tutorial is great! I'm teaching my daughter to sew this year, and I think I'll use this as another explanation for how to manage princess seams when the time comes. Wow, this is like having a class! It took me all weekend to cut the muslin out and then my sewing machine went haywire and is in bits and pieces on my desk while I pretend to be a mechanic. So I am going to be out of commission on the muslin for a few days. Patty, if you were able to put a picture up of your problem, some others may be able to help as well. Sometimes when working with such large seam allowances, things go awry and don't always match. 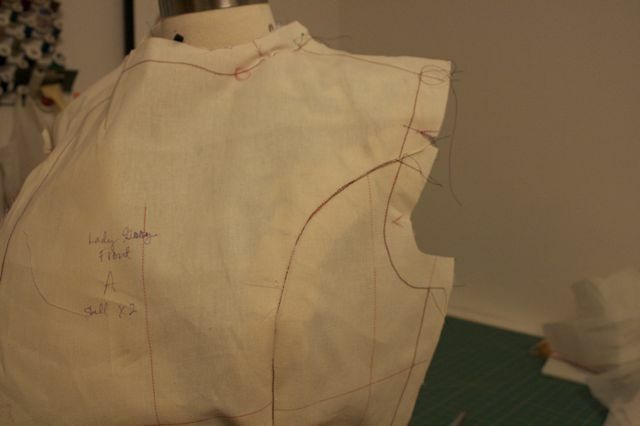 I added extra notches to the pattern so that I could have more points of reference when lining up the muslin seams. Another thing that could cause one layer going longer: I have a problem with whatever layer is on top "walking" and ending up longer than the bottom. I know this has to do with the foot pressure being too heavy but I can't change it on my machine. If that's the case there are tricks to overcome it. I know that when it comes down to the actual coat, I am going to bring the seam allowances to 1/2" and even further to 3/8" on the collar. 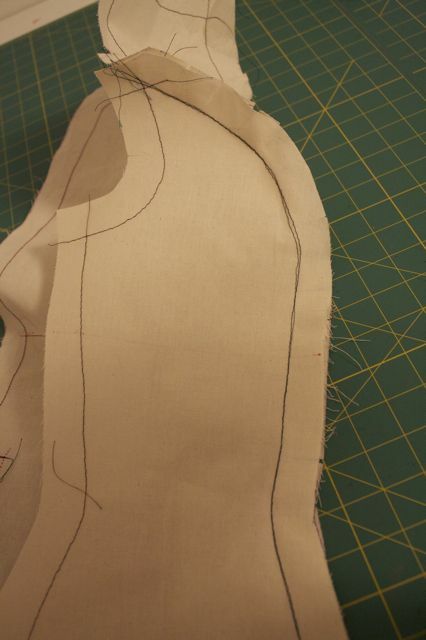 It really does help sewing curves accurately by having smaller seam allowances. Saw this and thought of you for your hula hoop outfit. Thanks for the tips, I recently made a princess-seamed dress with a bit of swearing.... Like a couple of others, I wonder if you have any tips on finishing the clipped/notched seam allowances for unlined garments? I was concerned about my dress and ended up top-stitching with the seams pressed towards the arm-sides, but this made the seams a bit 'stiff'. I've never heard of a tailors ham! What are they used for? Are they a 'necessary' or 'nice to have'sewing item? This is a marvelous tutorial and I love the part where you've actually shown us that you need to keep the notches and clips "in between" each other. I also like to notch and clip at a slant to avoid weird puckers along the outside. I've learned something new every post. Thanks for all of this! And I'm thrilled to learn about a tailor's ham. I've always tried to iron seams like this around the end of ironing board-- which doesn't work too well. I hope we can jump in late. I had to make an unexpected trip to the hospital and am in the throes of finishing up my last project first. Good questions, all! As for finishing seams, the only way I know how to do it is to serge all your seam allowances first, and then clip into them. I've never had a problem, mostly because I don't usually machine wash and I usually line as well. But I seem to recall a Threads article pointing out a solution to clips raveling. Let me see if I can find it . . .
Also, tailor's hams! In my opinion, they are an absolute must. Even if you're just making the simplest garment, it helps to press your darts over the ham. Patty, I just updated the post with close-ups of my seam. Does this help? And Amy - thanks for your comments - i actually just posted my muslin (um, mess) #1 to the photo pool and you can see my little pokey spire in one of the closeup photos - but it was really me not knowing how to line up the flat part more than not getting the whole thing lined up - I kept trying to have it parallel to the edge of the front piece, instead of more perpendicular like Gertie did hers! It worked, but it was bugging me that it was clearly not sewn quite correctly! 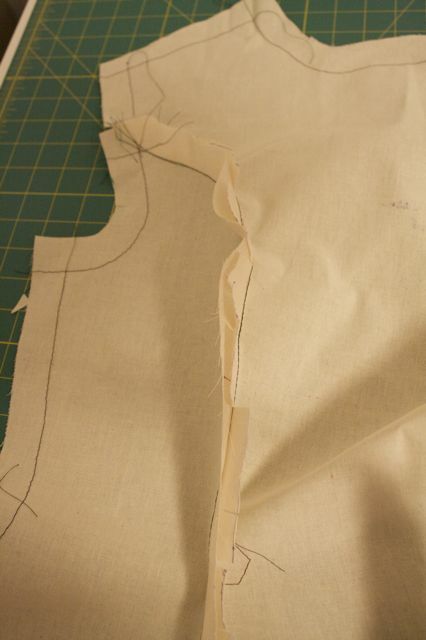 So i am a little behind and just now cutting out my muslin pieces. My problem is that I know I will need to somehow add inches to the waist ( I am super long waisted- I can't wear one piece swimsuits or anything with a waist really). In the few tops I have made myself I just add inches in lengthwise to the waist line and taper to them (did this with the Collette Sencha with no problems) but how do I do this with princess seams?? Any help would be really appreciated! I was surprised when, in sewing school, I was advised against EVER clipping seams. The method we were taught was to put the longer piece on the bottom and allow the feed dogs to ease the fabric onto the shorter piece. As for the pull created by the curved seam allowances, it was recommended we trim them rather than clip or notch. Not sure this is actually better than any other method (perhaps more in line with industrial production), but it does work just fine. 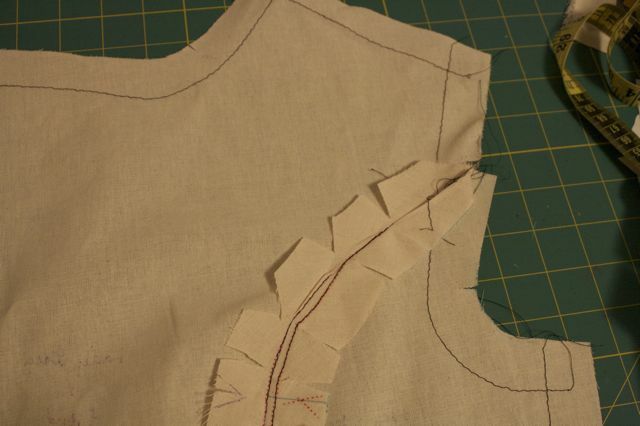 I'm not sure, but I seemed to have taught myself to do curved seams without any notching or clipping whatsoever. Basically what I do is work with one curved piece, and basically work up and down pinning, by making the alternating piece flat by pulling (carefully). Is this bad? Because my finished items have always turned out fine, as well as my muslin (so far). I just googled "how do you press a princess seam" and found this. I am making princess seams in a crepe blouse -- no lining. After you clip and press the seams FLAT, do you repress them to one side or the other? Do you trim them? I love your blog SEW MUCH. I read it for fun! Greetings from Australia! I have a question/dilemma I hope you may be able to help me with. What do you do re seam finishes when you are sewing curved seams (such as a princess bust seam)? Obviously, it needs to be clipped/notched, but then how do you neaten it all up and finish the edges when it's all hacked into? I have decided that I need to become a neater, more fastidious sewer (particularly when it comes to finishing and the inside of a garment, which usually ends up looking appalling!) Any advice would be greatly appreciated! Are you lining the dress? 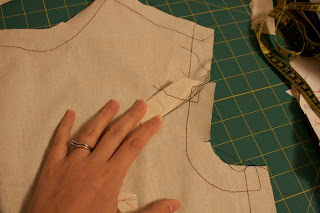 I think lining the bodice would be the easiest way, although Gertie will probably have other tips. Thank you for this! The instructions on the pattern I was using were very bare-bones, and this helped a lot. My dear, you utterly rock. I was doing some improv sewing and realized I'd set up a situation where I needed to do a princess seam, which I'd never done before, and clearly the pieces didn't match. I googled, found your blog, and now I get it. Thanks!